We will take the time to sit down with you and Counsel you about what you need and want in a diamond. We will educate you about Diamonds and explain what makes a diamond so expensive and what you can do to save money. Call for an appointment. This Diamond Buyers Guide will explain everything you will ever need to know about buying a diamond online or offline, The four C's, Polish, Symmetry, flourescence and how to get a good deal on the right diamond, once you have found it. The Larger the diamond, the more rare and valuable it becomes. Diamonds are measured in carat weight. One carat is 100 points. Ex: A 75 point diamond = 3/4 carat or 0.75ct. carat is expressed as "carat" or "ct". Do not confuse carat with Karat, which refers to the purity of gold. This is a standard representation of the clarity scale. What it does not show you is that with the naked eye, these all look the same from FL-SI2. Notice the small inclusions near the sides of the I1 Clarity diamond. The Facets will for the most part, hide those inclusions from being seen. An SI3 diamond will look just like the I1 except without the eye visible inclusioin in the table. I2 and I3 Diamonds have more inclusions and they tend to be bigger and more noticeable as well. The Better the proportions of a diamond are the more Fire, Sparkle, Scintillation, and Brilliance it will have. This also directly affects the price of the diamond. Ideal cut diamonds are rarer and cost more. Ideal cut round diamonds have a table % between 52 and 57%. Ther is no dimension on depth but most people prefer the depth to be between 59 and 62.5% Ther is also another train of thought that believes that the perfect diamond has a 60-60 make. that means that the depth should be as close to 60% as possible with a few degrees varience either way and the table should be as close to 60% with a couple of degrees varience either way being acceptable. Our take on it is this, While there is nothing more breathtaking than a textbook "Ideal cut", you can save some money by going with a slightly off make. We suggest: Depth: 58-63% Table: 52-61% If you stay within these parameters, you should end up with a very beautiful diamond. You can stray one ot two degrees outside of these parameters, but the farther away from ideal you go, the more it starts to affect the beauty of the diamond. Below is a diagram of what happens when a diamond is out of shape. If the diamond is too deep or two shallow, the light will leak out of the diamond through the bottom instead of shining brightly back up into your eyes. These dimensions are for round brilliant cut diamonds only. Click Here To Learn More about diamond Cut you will also find a chart here for the preferred proportions of all diamond shapes. This is where we come in. We can save you thousands. We can show you which properties of a diamond make the biggest difference in the appearance and what you can do to save money. If you are looking for an ideal cut diamond, Be prepared to pay high premiums elsewhere. Whether you are looking for the perfect Ideal cut diamond or the most bang for the buck. 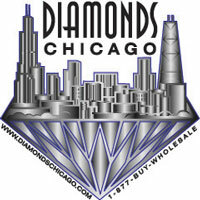 Diamonds Chicago can help you find your perfect diamond. Between our online stock and our offline inventory, we have over 50,000 diamonds. If you do not see what you are looking for, Give us a call 1-312-422-0400. We will not be undersold! If you find a diamond cheaper anywhere just call us and we will beat the price. For Engagement Rings in Chicago go to our Engagement Rings Chicago page.